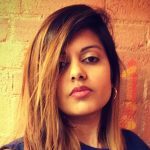 Pantomimes are all the rage during the festive season, and it’s no different this year. Taking the stage at Theatre Royal East is Charles Perrault’s classic, Sleeping Beauty. 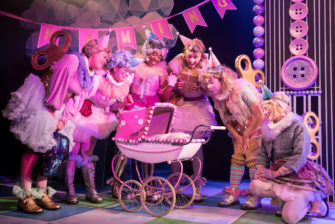 In keeping with the French storyteller’s tale, the production maintains sentimentality, throwing in standard panto cross-dressing and adult humour. 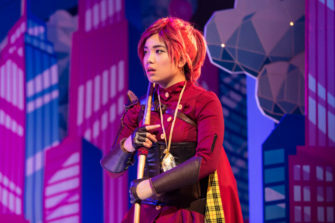 Director Matthew Xia acknowledges that the narrative is challenging to adapt, as Princess Scarlett slumbers for a century, but the production team successfully achieve a fresh reimagining. 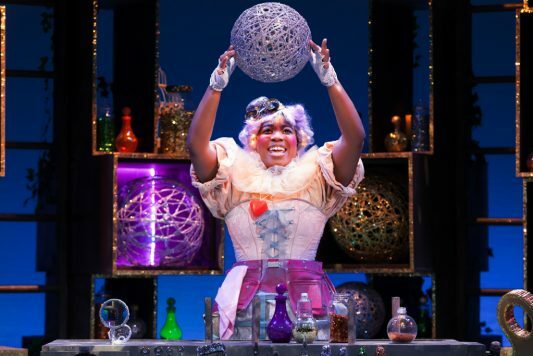 With original lyrics and music by Robert Hyman, the show gets viewers to their feet, singing and participating in the floss and dab dances – which pleases younger audience-members no end. Fairy Nightfall (Anthony Rickman) introduces the show before everyone is seated, seeming initially quite scattered but quickly improving. Soon thereafter, the whole theatre is led into a singalong of traditional folk song She’ll Be Coming ‘Round the Mountain, Rickman dividing spectators to see who can belt it out the loudest. Sketches like these circulate Xia’s piece, creating humour and a cheery atmosphere. 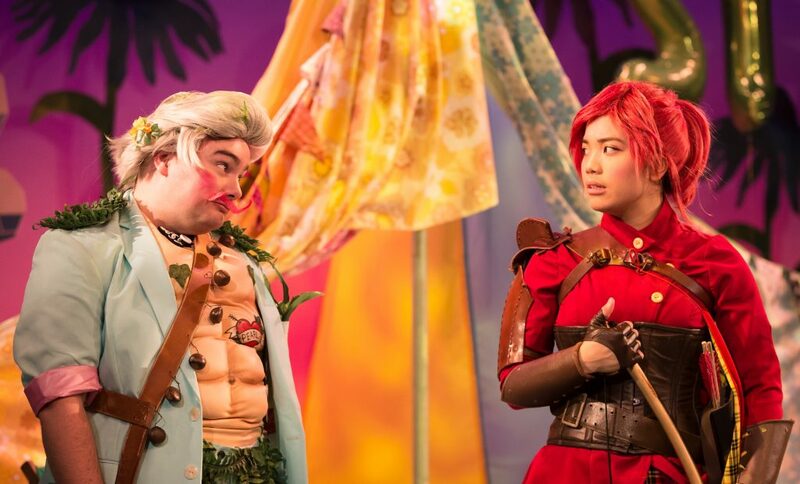 The main elements of the classic story are present: King Percy (Joshua Elliott) and Queen Pearl (Shaun Prendergast) wish to have a child, and are granted Scarlett (Ericka Posadas), who grows up to be a feisty young woman. Mauditious Le Vicious – played to cruel and conniving effect by Josephine Melville – feels rejected in her unrequited love for a mortal, and abandoned in her exclusion from Scarlett’s naming ceremony. 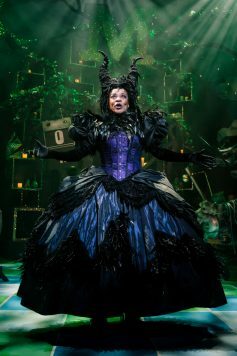 The witch is assisted by her looking-glass, Mirror Antoinette – played by Alice Frankham, who gives a great performance successively warbling in operatic style and rapping. Posadas’s singing does require some work, as the lyrics are lost amongst the live music. Naughty jokes are quite the thing in this adaptation, alongside imaginative set design – particularly when things take a darker turn and Mauditious tricks Scarlett. The show improves in the second half with a trip to the future, the costumes by supervisor Sydney Florence extravagant and very creative. 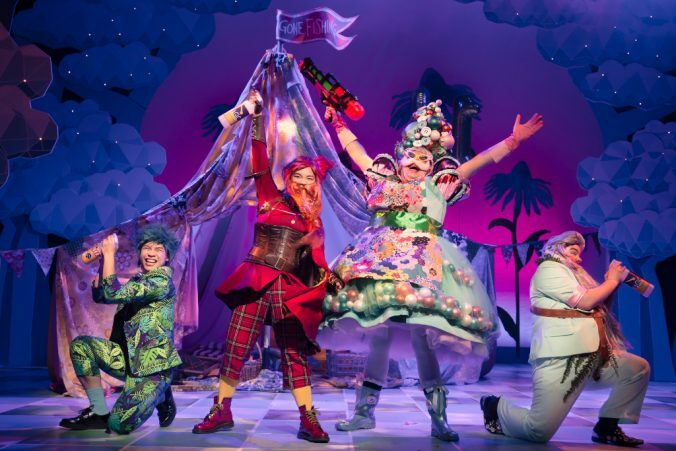 The cast are flamboyant; the standout performances are those of the sassy royal couple and Mauditious, the former pair producing constant laughs from the audience with their cheeky camp one-liners. As with all pantomimes, Xia’s ends on a happy note. The messages for Christmas 2018 are of acceptance, empathy and love. 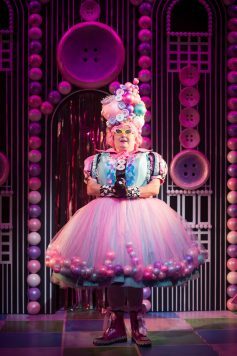 Perhaps a little too long in its duration, Sleeping Beauty can be a bit repetitive at times – with the typical boos and cheers of pantos – but it packs in plenty of razzmatazz punch along the way. 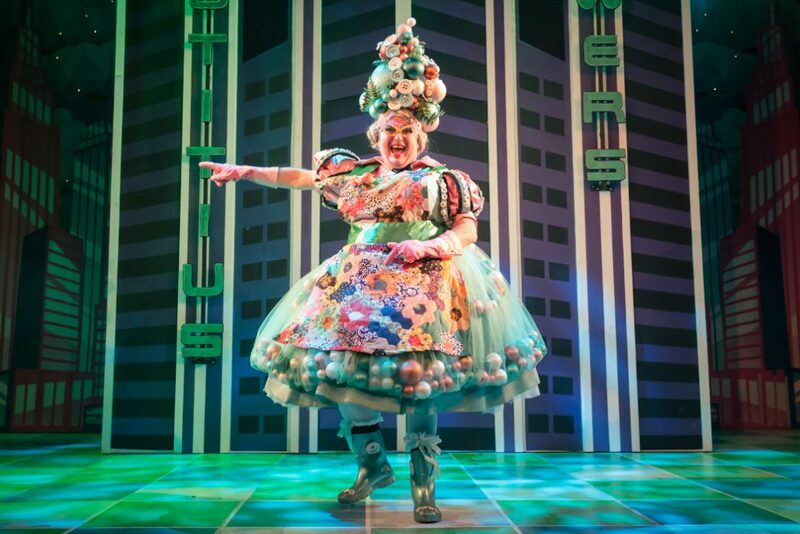 Sleeping Beauty is at Theatre Royal Stratford East from 1st December 2018 until 12th January 2019. For further information or to book visit the theatre’s website here.